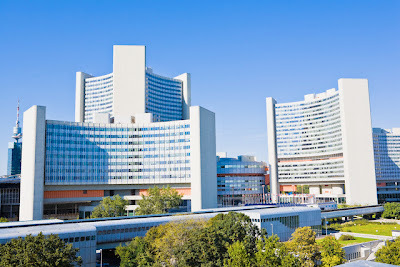 VIENNA- I attended the recent UN GIFT Vienna Forum and have much to share. I will break down these posts into separate parts, each post covering either part of a day in the conference or one specific session if there is a lot of material to cover. I will post about the events I was able to attend, however as there were many events, it will only represent a small amount of the knowledge that was shared among the hundreds of experts, academics, NGO representatives, government officials, UN officials, and civic activists that were there over the course of last week. All together, I understood that about 1,500 people attended the conference. 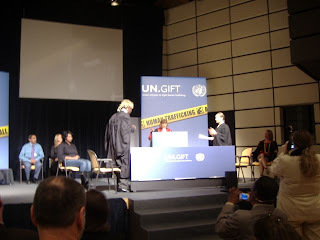 It was an exciting opening day to the UN GIFT Vienna Forum on Wednesday. Lyse Doucet of the BBC served as the moderator for the opening panel of speakers, which included Antonio Maria Costa, the Executive Director of the UNODC (you can find his full opening speech here), Ursula Plassnik, the Austrian Minister for European and International Affairs, First Lady Suzanne Mubarak of Egypt, actress and Chair of the Helen Bamber Foundation Emma Thompson, and singer Ricky Martin. Minister Plassnik touched on an issue that seemed to reoccur throughout the other sessions I attended and that was coordination: coordination between state and non-state actors, coordination on a regional scale, coordination on a global scale. Essentially, that the fight against human trafficking needs an organized center so that the criminals aren't more organized than the people trying to stop it. I do have half of First Lady Mubarak's speech here. Her second half addressed many issues including the different elements of Egypt's success in anti-trafficking measures and the International Women's Peace Movement, which Mubarak started in 2003 to promote peace and human security. The Movement also has the End Human Trafficking Now Initiative, which works with the business community. She also highlighted things like the involvement of the private sector, the importance of legally binding international instruments such as the CoE convention, and the steps against trafficking taken by Arab states (especially the Arab League and the Arab Women Organization). Emma Thompson's speech was especially moving as she told the story of a young woman who was trafficked from Moldova to the massage parlor on the street Ms. Thompson grew up on. This woman became part of the inspiration and a contributor to the exhibit "Journey". The exhibit has been on display throughout the conference outside the Hofburg Palace. Steve Chalke, the Chair of Stop the Traffik, delivered a dynamic speech about the power of grassroots action by discussing the end of the gladiator games in Constantinople and the power of a 21 year-old monk that sacrificed himself to end the brutality of the games. Mr. Chalke then explained Stop-the-Traffik's humble roots, and how it grew to where it is today. He then delivered the 1.5 million signatures collected by the campaign and delivered them to Mr. Antonio Maria Costa of UNODC. The delivery was accompanied by a video of the campaign to gather the signatures. Mr. Costa then delivered his speech that explained the efforts of UNODC and the importance of regional cooperation. He also mentioned that the UN General Assembly will be taking up debate on this issue in May or June of this year. While the opening session ended, the program rolled right into statements by various government representatives who gave speeches on the activities and commitments of their respective countries including First Lady Margarita Cedeño of the Dominican Republic, Chair of the UAE's National Committee to Fight Human Trafficking Dr. Anwar Gargash, the Minister of Foreign Affairs for Belarus, the Minister of Foreign Affairs of Nigeria, and Indonesia's Minister for Women's Empowerment Dr. Meutia Hatta. Their speeches encompassed a very wide range of topics, all of which were addressed throughout the sessions of the conference. That day, I was able to attend two more sessions. The first was "Criminal Justice Responses to Human Trafficking" and it was set up as a mock investigation and trial with the purpose of identifying detrimental and recommended practices especially in relation to the rights of the victim. It was opened with a short performance by Emma Thompson and followed by a series of good/bad scenarios in the police station and court house. The scenarios that attempted to show detrimental practices or the "bad" scenarios showed the investigator using insensitive language to the victim, an assumption of consensual involvement in prostitution, allowing a translator to apply pressure on the victim using native derogatory phrases, etc. The "bad" court room scenario allowed for the trafficker to have contact with and harass the victim before the trial began, a poorly prepared prosecution, and the judge allowed a purposefully intimidating line of questioning. The scenarios intended to show the recommended practices when dealing with a trafficking case included an officer that used clear language, but used leading questions that eventually brought out the whole story of the victim without further adding to the trauma. He also asked for consent to allow an NGO representative to sit with the victim while she gave her testimony, and the representative then explain the services they have to offer the victim. 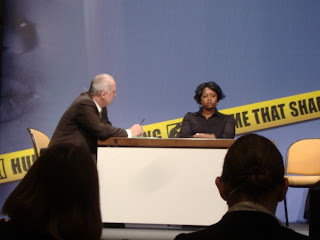 The "good" court room scenario provided the victim with protection by bringing in a screen that hid the victim's identity from the public, as well as a well-prepared prosecutor with corroborative evidence, and the judge prevented the victim's personal sexual history from entering into evidence. The audience discussed their thoughts and experiences after the scenarios were played out, and some concerns were raised with the recommended practices. For example, the NGO representative offered comfort to the victim while she told her story, and a member of the audience said she would never do that as the victim is most likely already traumatized by physical contact. Another objection was raised that the NGO representative was even at the police station as the victim should never feel confused about the role of the police and the role of the NGO. 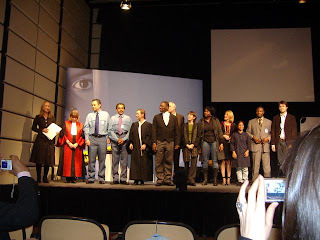 This also led to a debate as to whether police could conduct interviews at the NGO, however an officer in the audience felt that this tends to raise fears among other victims at the NGO and may put the victim at risk as everyone else at the shelter would know who was talking to the police. Overall, I would say the presentations were a little overdone and unlikely, however, at the same time, court and investigation procedures are an important part of combating the crime, yet have been one of the slowest elements worldwide to be brought up to speed. Hi John, thanks for letting me know! I will be there. What organization are you affiliated with?